Sciblogs | Good news on declining smoking rates, especially for Māori. Is it credible? What next? Good news on declining smoking rates, especially for Māori. Is it credible? What next? Smoking rates have fallen in the 2013 Census compared to the 2006 Census (from 20.7% to 15.1% in adults aged 15+). The results generally fit with other evidence and are good news for health in NZ. And late today Tariana Turia has announced that rates for Māori have fallen nearly 10 percentage points from 2006 to 2013, or from 42.2% to 32.7%. Which is fantastic news. This blog considers the results in more detail (for all ethnic groups combined, as Māori data is not yet on the Statistics NZ website), and asks what else could be done to accelerate progress towards a smokefree nation. Statistics New Zealand has released Census data today showing that were 463,000 current smokers on Census night in March of 2013. That is a fall in the absolute number of smokers of 22.6% since 2006 – ignoring those people not replying to the smoking question. Allowing for modest growth in the adult population between censuses, that is a 24.4% fall (or a 4.4 percentage point fall) in the smoking prevalence. The new results seem credible given the decline in national tobacco sales (from 2.52 million kg in 2006 to 2.07 million kg in 2012, see these data). They also fit with marked reductions in youth smoking rates (from school surveys) in the last decade or so. There is also some consistency with declines measured in national health surveys, though these have shown more limited reductions. That is, adult smoking prevalence ‘only’ fell from 19.4% (95% confidence interval 18.5% to 20.3%) in the 2006/07 New Zealand Health Survey to 17.8% (16.8% to 18.7%) in the 2011/12 Survey. Finally the results are consistent with the international evidence that various forms of tobacco control are effective at the community level – including such interventions used in NZ of: 10% per annum tax rises, extensive Quitline activity and DHB smoking cessation support. 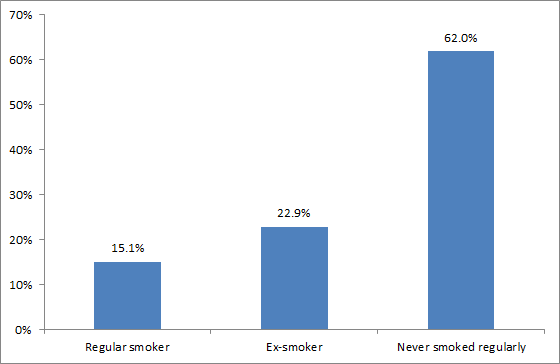 But on a more cautionary note, if a third of those who did not give an identifiable response (or any response) to the smoking question in the Census, did actually smoke regularly, then the true prevalence would be a bit higher at 17%. Another issue is the key results around smoking rates by ethnicity – given the importance of smoking in causing health inequalities in NZ. The recent comparisons of health survey data were not good news, with Māori rates not changing – be it with wide confidence intervals ie, 37.5% in 2006/07 (95% CI 35.2–39.8) and 37.3% in 2011/12 (95% CI 34.6–40.1). This is where a census is so important – it is not a survey, but involves measuring the whole population. Increase tobacco tax by at least 10% per annum (as currently used in NZ – it may need to be higher for Maori to achieve 5% prevalence by 2025). And extend this beyond the year 2016 – when the current period of regular increases ends). Dedicate some of the tobacco tax revenue to tobacco control. This approach makes tax increases more acceptable to smokers (and there are NZ data on this) and can be used to fund mass media campaigns and cessation services. Greatly expand smokefree areas so that these cover prohibiting smoking in: cars with children (see a previous blog post), outdoor areas at hospitality venues (see this blog post), parks and sports fields, and at bus stops and other transport settings. These actions reduce harm from secondhand smoke exposure, reduce litter cleaning costs and help to denormalise smoking further. Explore reducing access to tobacco outlets (eg, licensing of outlets and eliminating these near to schools). Explore denicotinising tobacco over time (ie, to make quitting easier and addiction of youth less likely, and as part of final push to 2025). Continue current progress towards requiring standardised “plain” packaging of tobacco products (as per Australia). All these interventions are likely to be relatively low cost to implement ie, the cost of a law with potentially some monitoring and enforcement costs. Probably the big cost is the “political will” that would be required, although these moves could be reputation building for political leaders (this was the case in Australia where the government won against the tobacco industry on plain packaging). Better funded mass media campaigns – especially by Māori for Māori campaigns (but also building on state-of-the-art campaigns run in California and Australia). Strengthening of quitting services delivered by the Quitline and by other health services. It is possible that an expansion of internet-based quitting services might be one of the most cost-effective approaches for personalised support. (See evidence for the latter in a recent systematic review). Ideally good research, including modelling work and cost-effectiveness analyses, will better inform the optimal mix of tobacco control approaches. Nevertheless, there is already a very strong public health case for adopting many of these interventions given the current scale of harm from the tobacco epidemic on the health of New Zealanders.